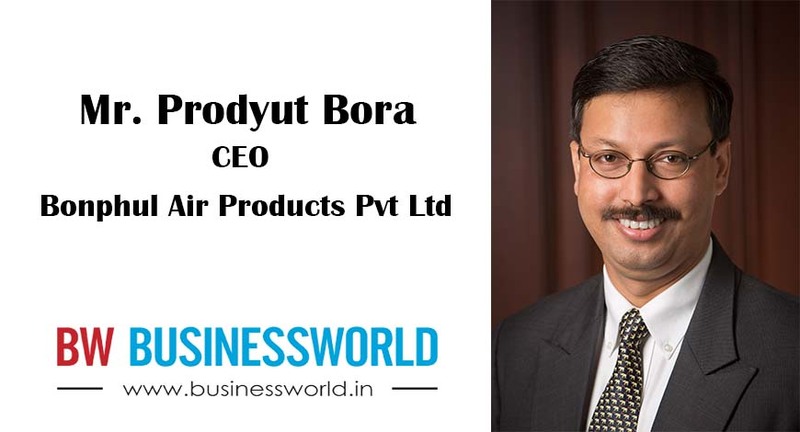 Exclusive interaction of Mr. Prodyut Bora, CEO, Bonphul Air Products Pvt Ltd with BW. What is the expected market size of Indoor Air Quality solutions in India? The Indoor Air quality solutions is a new category and still very nascent. Hence the best we can rely on are proxy indicators, not real data. The size of the air-conditioning market is Rs 25,800 Crores (of which, Rs 11,800 Crores is residential & light commercial, and Rs 14,000 Crores is heavy commercial). So, one can very well image the growth of this new category in years to come. How do you explore a potential client as people are still concentrating more on air filters only? Heightened awareness of the importance of indoor air quality and growing concerns on the impact of impure air quality and deteriorating oxygen levels on general well-being of people have raised demand not just for air purifiers but also oxygen optimizers. Increasing disposable income, rising hygiene concerns and aspiration to lead a healthy lifestyle is what is driving the demand for newer and innovative indoor air quality solutions. Do you have plans to penetrate other regional markets apart from India? At present we are focusing on North India and thereafter we will penetrate the south Market. We will be making international footprints but nothing is planned as of now. What are the USP of Bonphul products? Are they indigenously built/designed? Bonphul Air Products, the developer of OxyMax, India's first—and the world's second—oxygen optimizer with an integrated air purifier will give the users filtered air, enriched with oxygen. Also, Oxymax is a product idea that has come from our customers and is ideal for the Indian market. Until now stand alone air purifiers certainly cleaned particulate matter inside a room, but keeping a room closed too long caused the problem of suffocation. However, if one were to open one's door or window to let fresh air in, along with fresh air comes dust and pollution, negating the earlier work of the air purifier. Hence we decided to come up with a machine that combined—the air purifier and the oxygen optimize. Some of the parts of our products are imported as we are the first company to come up with an Oxygen optimizer. However we will soon set up our own manufacturing plant. But things are still in the pipeline. You have been part of India’s biggest political party. Do you find lack of political commitment as a reason of rising air pollution in India? Absolutely! There is a total lack of political commitment from all parties. When in 5 years the ruling party couldn't clean up the Ganga--even after its ideological commitment--what can we expect about outdoor pollution? You offer an oxygen optimizer that enhances indoor oxygen levels. What are the effects of such system on external surroundings? While designing the product we have been very careful that it is energy efficient and does not harm the external environment. It is an eco-friendly unit. What are the major domestic focus regions for you? First let met make you aware that as per a report released by World Health Organization recently, The 14 of the most polluted cities in the world happen to be in India. All these cities are our geographical focus. But yes, Delhi- NCR is something that we have been aggressive with. There is alarming rate of PM 2.5 levels in tier two cities like Prayagraj, Gwalior & Ludhiana; Do you have plans to offer a relatively low cost IAQ systems for such tier two towns? There is alarming rate of PM 2.5 levels in tier two cities like Prayagraj, Gwalior & Ludhiana. Do you have plans to offer a relatively low cost IAQ systems for such tier two towns? Yes, we are planning to get in low-cost, entry-level gadgets that would be able to provide at least a basic level of coverage.